talents were not being overlooked and that not all factory work was dirty. the Bofors Breech ring. This was considered as one of the most highly skilled jobs in the Royal Ordinance Factory, where she worked in Newport, and one which would normally only be attempted by a man with 8 or 9 years training. Ruby aged 21, mastered the operation after just under two years training. This painting is recognised as being one of the artist’s best war work pictures demonstrating a photographic eye for detail and an extraordinary command of painting techniques. 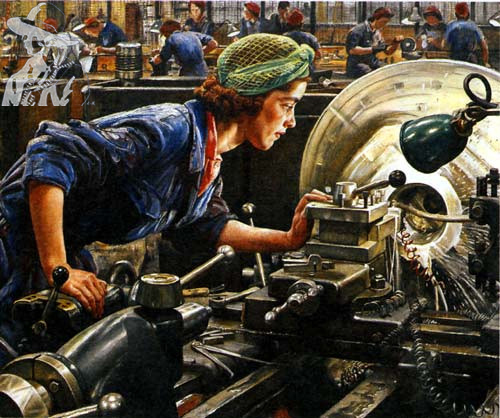 The work was popular amongst industrialists and on Ferranti asking for a copy of the work to be hung in their factory, The War Artists Advisory Committee decided to produce a poster version of the picture.